In 1970 a group of Middlebury residents decided that the community needed a safe supportive program for the children of families who needed to work outside of the home. They wanted to ensure that children, particularly the children of struggling single mothers, were being well cared for. Today that program, Mary Johnson Children's Center, is a leader in early childhood education both in the county and in the state. 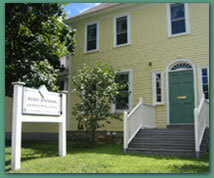 The Center is home to several programs which support children and families. Reflecting the goals of its founders, the Center strives to meet the needs of working families who use the Center and who represent the economic and cultural diversity of our community.